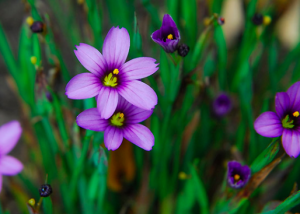 Diminutive and flowery little Blue Eyed grass that forms dense colonies of grassy green foliage to just 5″ high and is topped with a non-stop display of single purple flowers. Full sun and rich soil with regular summer moisture. Blooms continuously. Forms spreading colonies quickly when happy. Seldom sets seed. Easy to grow long lived plant for a big floral display. Winter deciduous. This cultivar has been grown in England for more than 100 years. Pretty cool.